While complications can arise throughout a pregnancy, it is during labor and deliver when the risks – and the potential for catastrophic mistakes by doctors and nurses – are the highest. The decisions made by medical professionals in the delivery room, the problems they recognize and the actions they take in response, can make the difference between the joy of bringing a new life into the world and the heartbreak of a serious birth injury or harm to the mother. When labor and delivery negligence leads to tragic consequences, families can turn to the Washington DC birth injury lawyers for help during a challenging time. We have a long track record of obtaining compensation for victims of labor and delivery negligence, and are committed to getting our clients the resources they need and deserve in order to move forward with their lives. 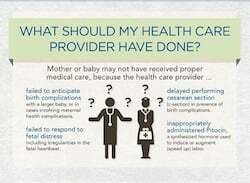 What is Labor and Delivery Negligence? Not everything that goes wrong in a delivery room is the result of mistakes by doctors and other healthcare professionals. Sometimes, however, those professionals fail to use the judgment, make the decisions, and provide the care necessary to prevent harm to the mother and child. 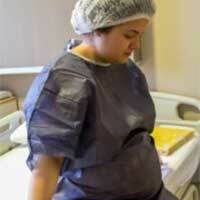 When those actions fall below the appropriate standard of care, it can constitute labor and delivery negligence. The Rich Firm, PC’s birth injury lawyers hold doctors and other negligent parties responsible for the injuries caused by their malpractice during childbirth. Medicine is complicated, and so is the law. Determining whether an act of labor and delivery negligence occurred and was the cause of a birth injury requires an in-depth understanding of both. At The Rich Firm, PC, many of our birth injury attorneys serving families in Washington DC are also licensed physicians. This unique combination of knowledge and experience allows us to promptly determine what happened and whether mistakes were made. If so, we aggressively pursue compensation that can help pay for medical expenses, lost income, pain and suffering, loss of relationship, and funeral expenses. If your child has suffered a birth injury or you have suffered medical complications that you suspect were caused by labor and delivery malpractice, please give our Washington DC birth injury lawyers a call at 888-RICH-LAW (742-4529) to set up your free consultation or contact us online. We look forward to assisting you.